Pencil on Arches hot pressed watercolour paper. Scan slightly darkened digitally. 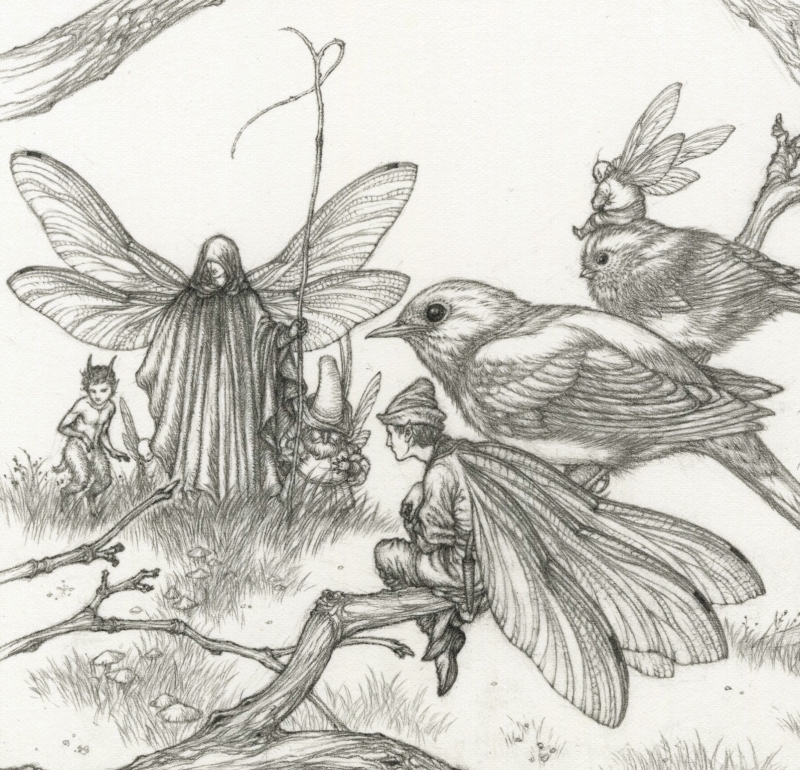 Detail from panel 7 of Pictura: Faeries, Templar Publishing, 2013. 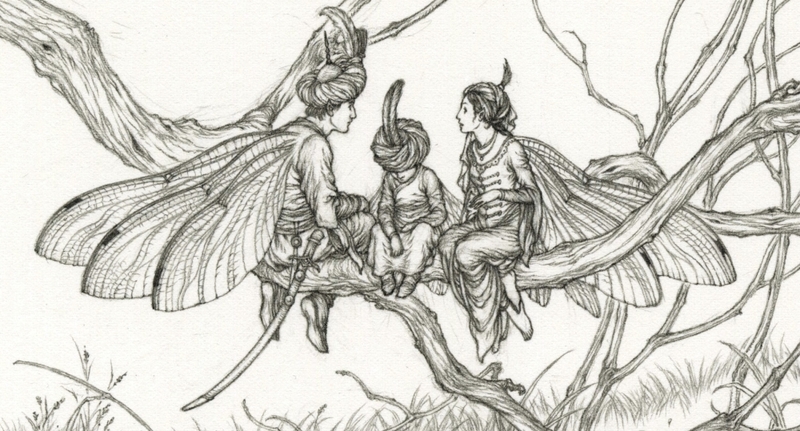 I call this the ‘Scheherazade Group’. I hadn’t planned it thus, but the description seemed to fit as the image came into being. Two final Pictura events for me, once again together with Helen Ward, both at the Laing Art Gallery in Newcastle. 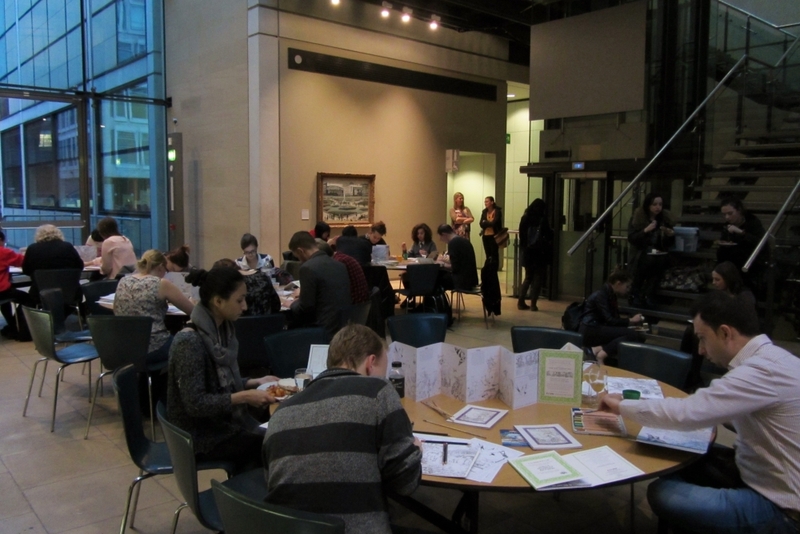 Evening Ink & Drink on Friday 1st November, and two daytime illustration workshops on Saturday 2nd. 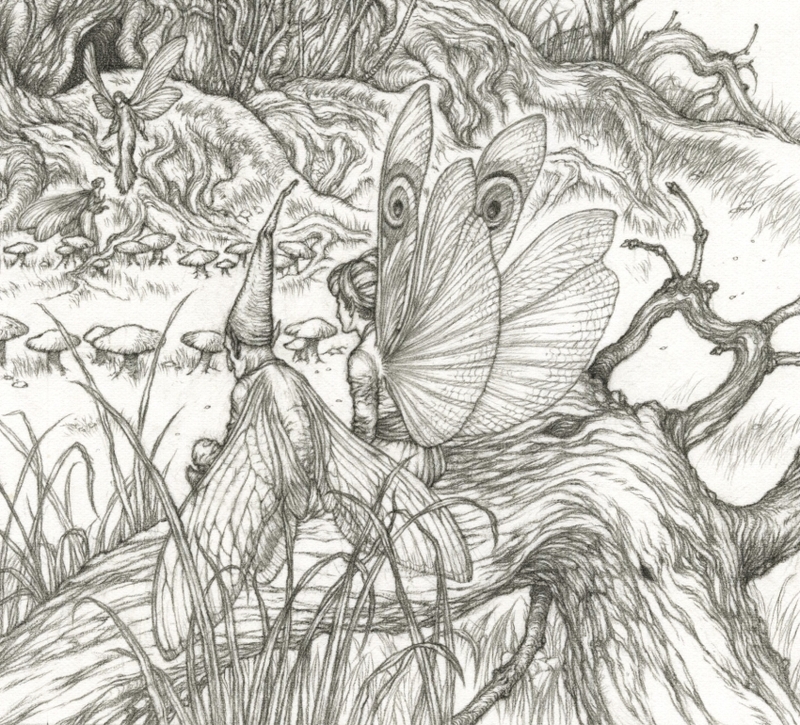 Pictura: Faeries, detail from panel 5. Pencil on Arches hot pressed. 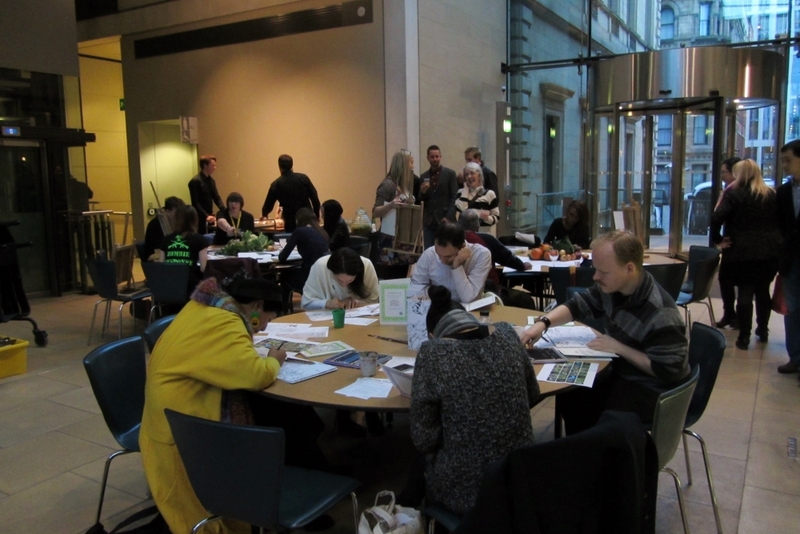 I’m much later with this post than I’d expected, but here is a report of the Ink & Drink event at Manchester Art Gallery last Thursday. The turn-out was very good once again. I hadn’t managed to find out what the estimate was this time, though as Manchester Art Gallery is far larger than William Morris and the space allocated for the event more expansive, it is probably safe to assume that the numbers far exceeded those of the latter. And after all, there were two of us illustrators presenting. I’m pretty certain they all came to see Helen Ward (and quite rightly, too). The activities themselves had a little more variety this time. 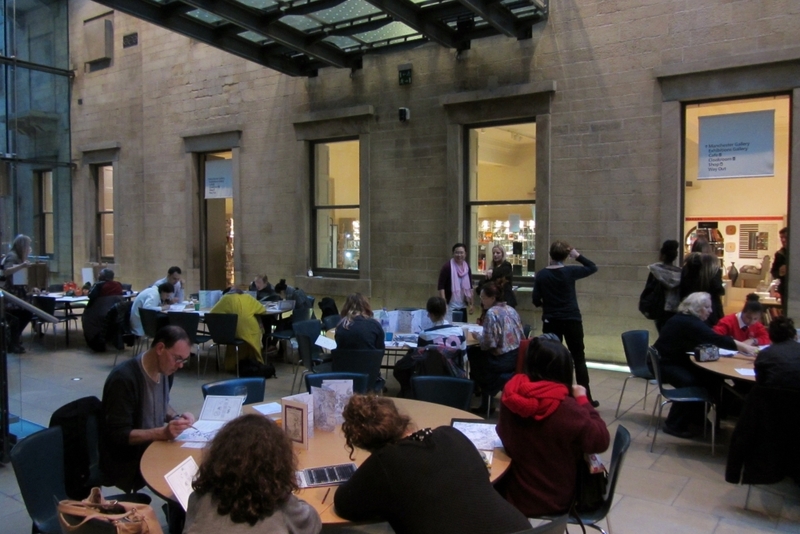 Aside from colouring in their copies of Pictura, visitors were also encouraged to draw. Produce from the gallery’s very own rooftop garden provided still-life set-ups. 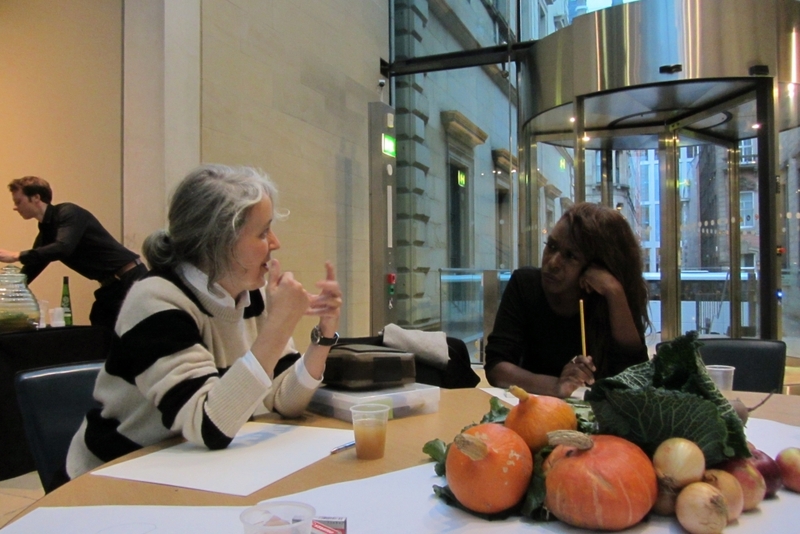 That same produce went into the ‘harvest feast’ which was on offer to help sustain the visitors during their work. I didn’t manage to eat anything myself (which I deeply regret), but I did get to sample a delicious cup of ginger beer. Helen Ward speaking to one of the visitors. Helen courageously drawing the beetroot. Prior to the evening event, both Helen and I gave a talk in the afternoon to a group of around fifty BTEC students from Manchester College currently focusing on narrative illustration. 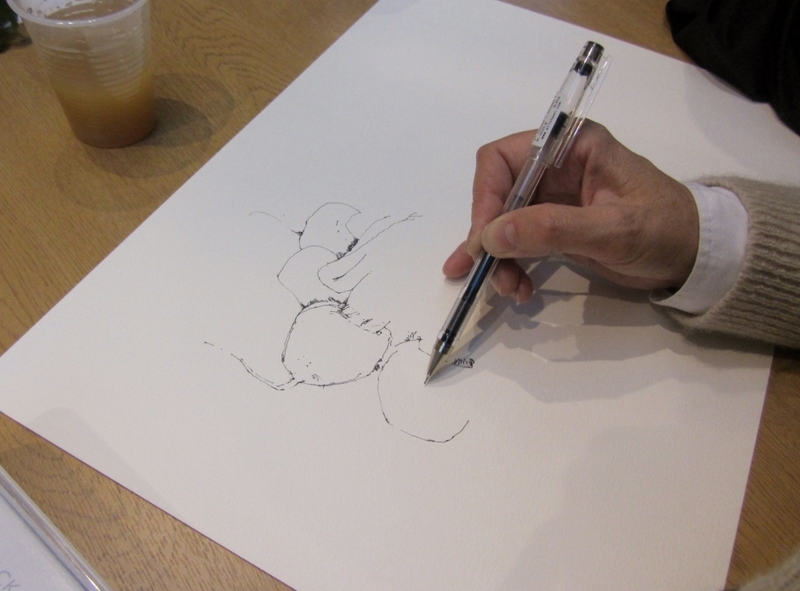 I managed to give myself a stomachache from sheer nerves, but judging from the students who stayed behind to look at our sketches and remained for the evening event, I think we might have managed to engage the interest of at least a few. 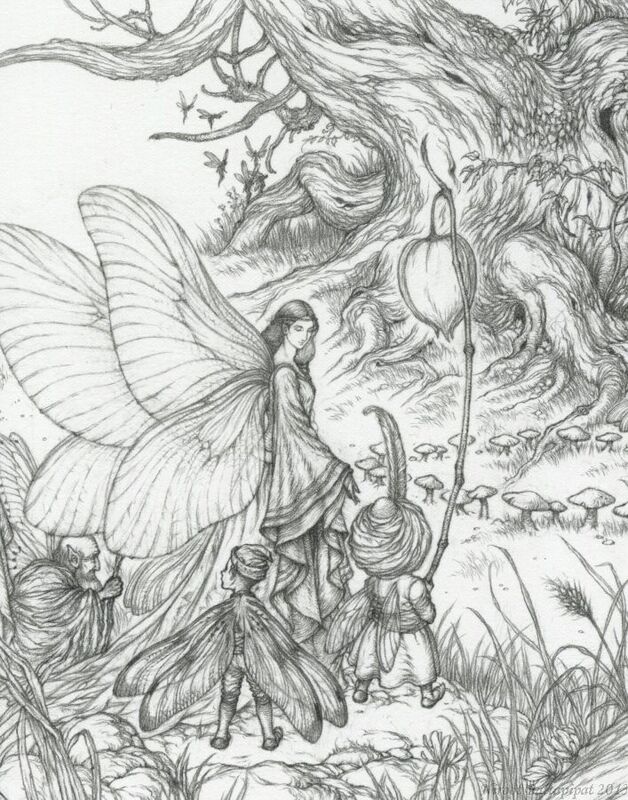 One student even drew her own version of one of the faeries from my Pictura, which was just wonderful to see. I think my evening was made. The tutors too were enthusiastic and very supportive, which I was very touched by. One of the highlights for me when they spoke to me later in the evening was their kind commendation of the ‘breadth of knowledge’ which seemed to inform my work. They spoke too of the cultural variety it seemed to present, and remarked on the integration of eastern and western styles. When asked whether I traveled much, I replied that I regrettably don’t as much as I would wish. 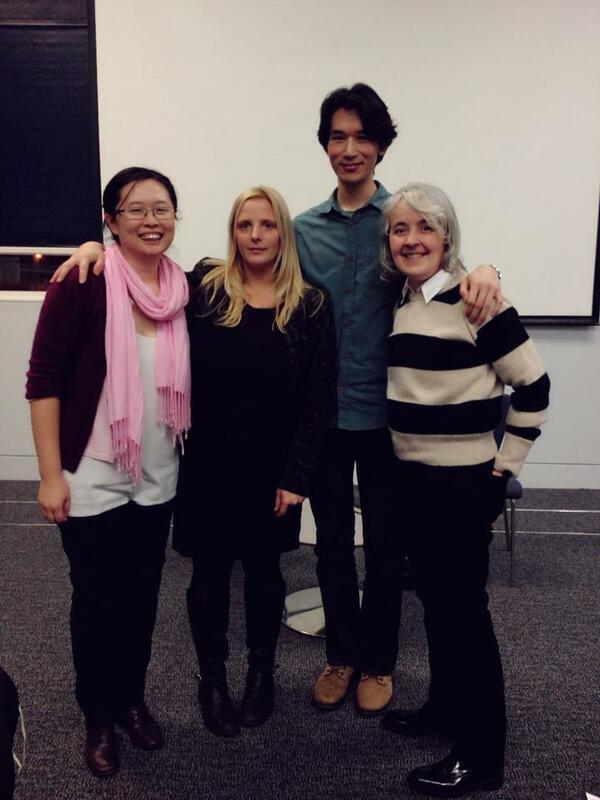 From left, Nghiem Ta and Emma O’Donovan from Templar Publishing, me, and Helen Ward in the lecture theatre. Picture taken by visitor, Carolina Feng. Another successful event, then. I did enjoy myself very much in spite of the nerves. The change of scene and the experience shift which these events have provided have been very welcome for me. I also very happily made friends with Helen Ward, of whom I have long been a huge fan. If you missed the Ink & Drink event at the William Morris Gallery as part of the Pictura launch, the next stop is at the Manchester Art Gallery this coming Thursday 17th. This time with both me and the award-winning author and illustrator, Helen Ward, who illustrated Hedgerow Year for the series (I think I come by way of the consolation prize in this instance). The event, once again, is free. Do drop by if you can, or spread the word! 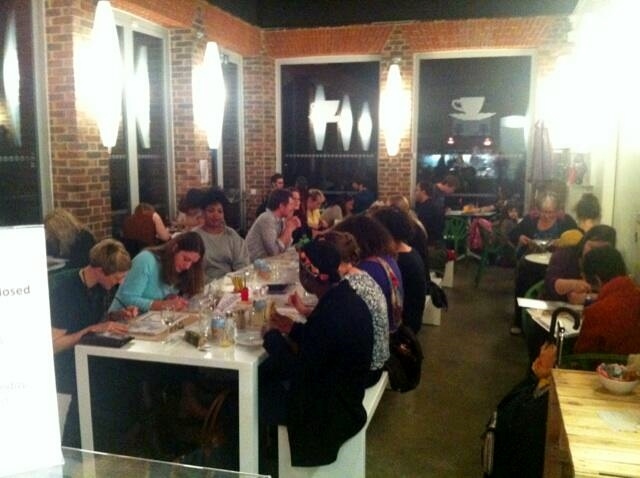 I think perhaps we may pronounce the Ink & Drink event at the William Morris Gallery last evening a success. I was a little overwhelmed by how many visitors turned up, especially as I had envisioned about five or six people, together with a tumbleweed and several crickets. 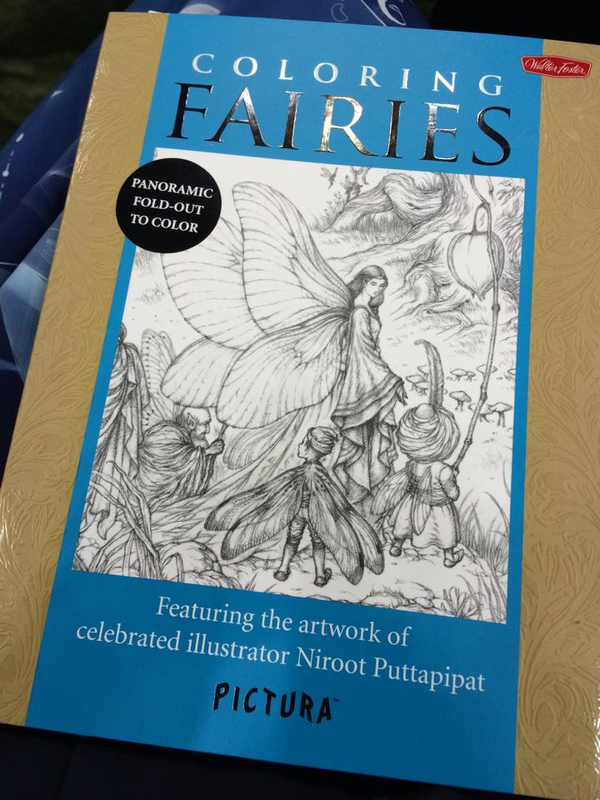 As it is, the free copies of Pictura which were given to the first one hundred arrivals had all gone before 8pm. 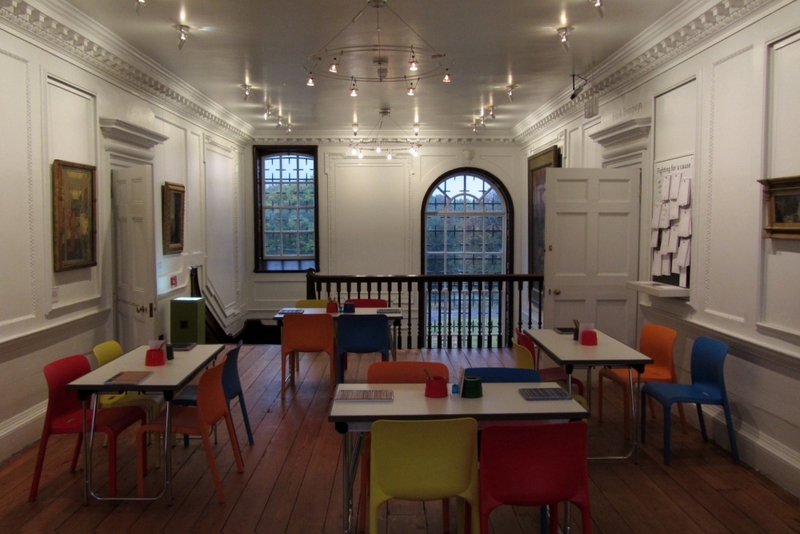 The ‘Story Lounge’ upstairs in the William Morris Gallery before the event opened. 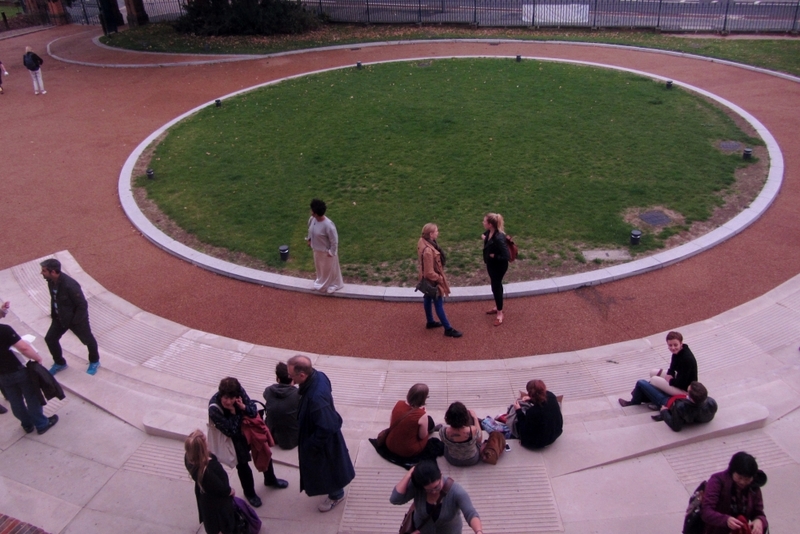 Guests queuing in front of the gallery before opening. The curator told us they’ve ‘never had this before’. 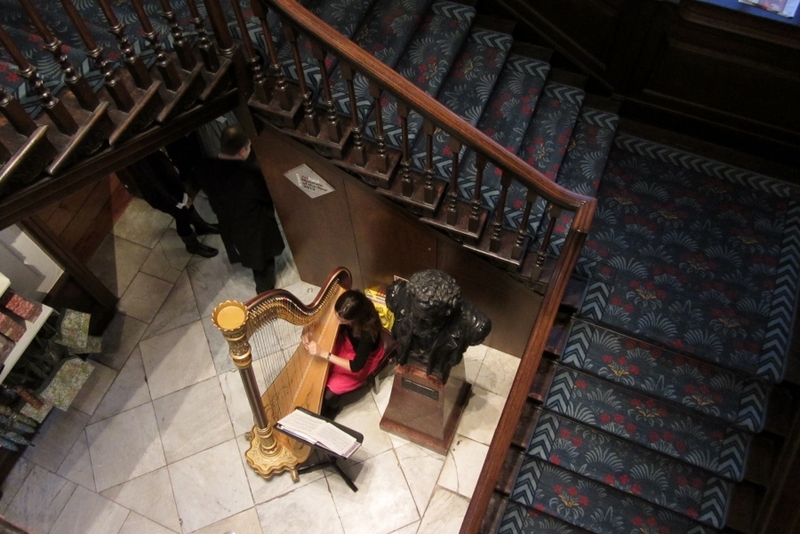 The harpist who provided musical accompaniment throughout the evening. I never got the chance to greet and thank her before she left. 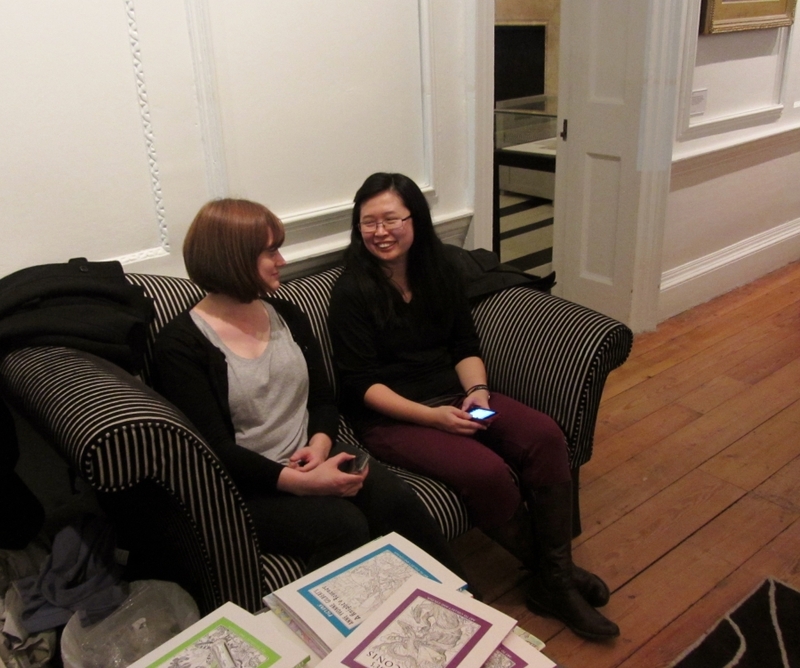 Laura Smythe and Nghiem Ta from Templar Publishing. Laura is responsible for organising all the Pictura events. Nghiem is the designer with whom I worked and the creative brain behind the series. …As this picture taken by Nghiem demonstrates. It was wonderful to see so many people absorbed in simply colouring in and finding the activity exactly as rewarding and therapeutic and we had hoped. A good number of visitors also responded very kindly to my original artworks and books which I had brought along, and said how well they had enjoyed the evening, which I was of course very touched by. 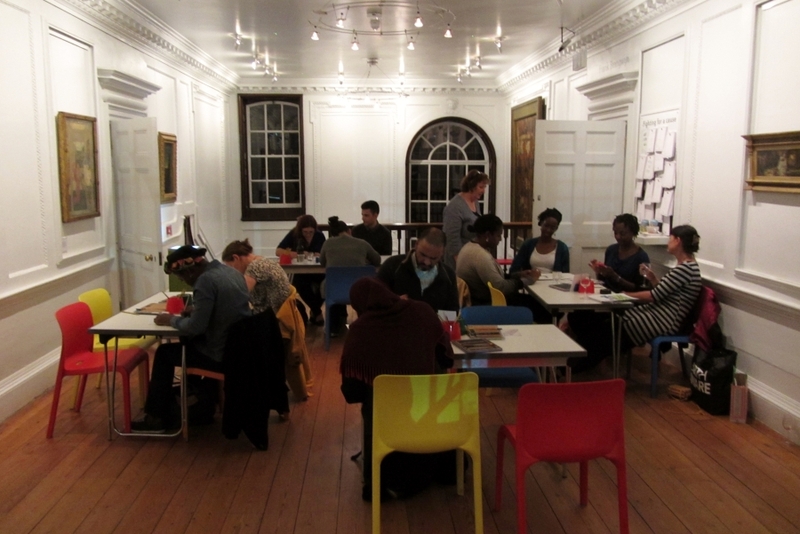 Thank you so much to all who attended, and to Templar, The Big Draw, and the William Morris Gallery. 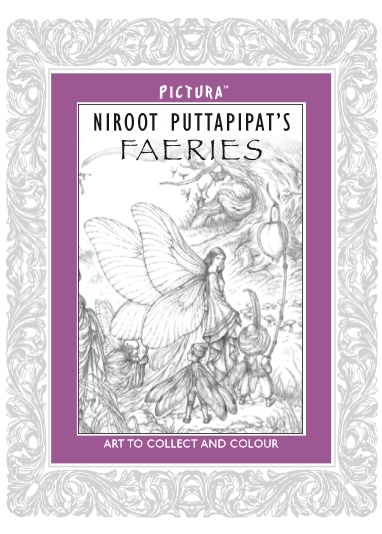 The Pictura series from Templar publishing has launched! 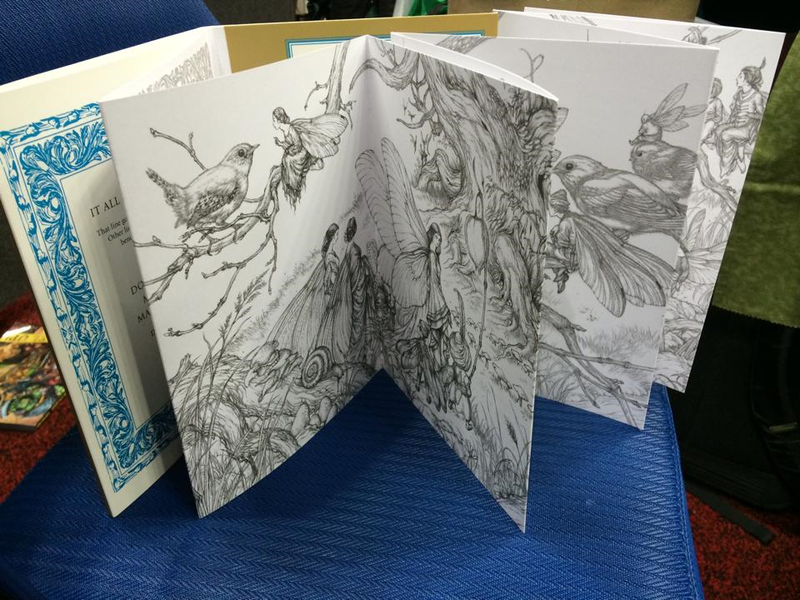 You can view my Faeries and all the other titles in the first wave on the website, including slideshows and videos. 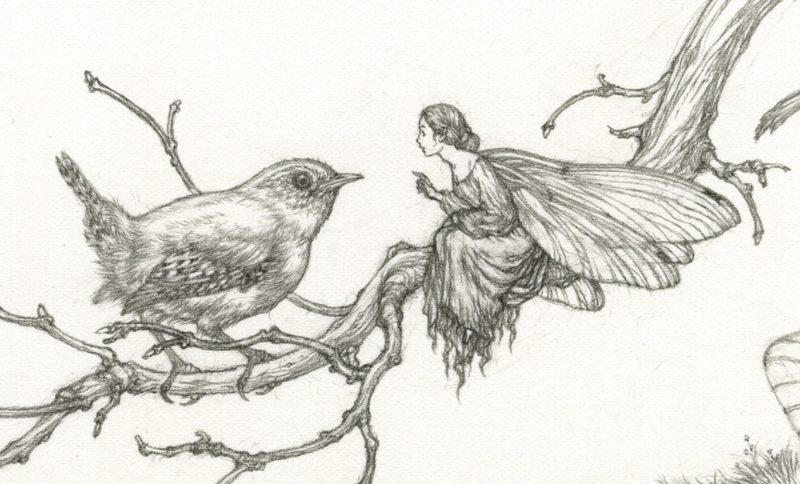 The faeries beckon. Join us! A word on Design Week about the Pictura books (which include a title by yours truly), published by Templar and launching in October. A reminder once again that the ‘Ink and Drink’ event at the William Morris Gallery with me is this Thursday. Do drop by or spread the word if you can. The Ink and Drink event I mentioned in the last post has now appeared on the William Morris Gallery’s events calendar! Please visit this link for details. I’m afraid I can’t promise the ‘expert guidance’, though. A clumsy one, certainly.